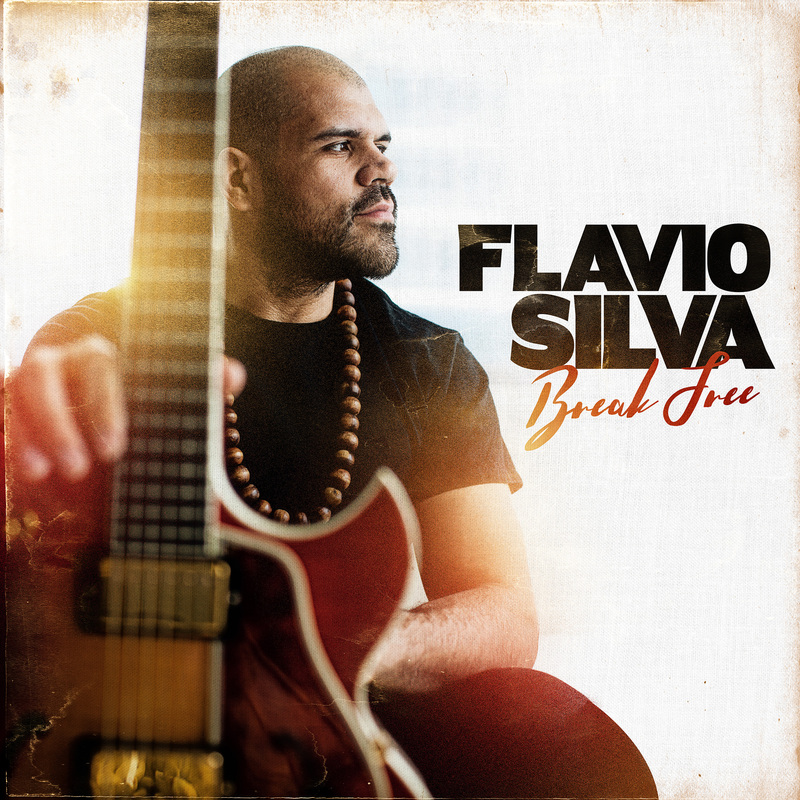 Brazilian guitarist and composer Flavio Silva is proud to release his sophomore album Break Free TODAY! Featuring a talented line-up including saxophonist Seamus Blake, bassist Alex “Apolo” Ayala, drummer Curtis Nowosad, pianist James Francies and vocalist Michael Mayo, Break Free is a call for love, hope and justice through music. While jazz remains to be at the core of this eight track compilation, Break Free is an exploration between cultures, and so incorporates the American art form with both African and Afro Brazilian sounds. The multi-brand endorsee presents this dynamic and versatile music with particular dexterity and flair, while maintaining the attention and appreciation of all music lovers. Silva and his band will be celebrating the release of Break Free at Cornelia Street Cafe in New York City on July 15th. Break Free is a journey through cultures, genres and life experiences. The album consists of seven original compositions by Silva and one cover, “Samba e Amor”, by the great Brazilian vocalist and composer, Chico Buarque. While the compositions are adventurous, Silva delivers each track in a distinct way to ensure that the music can be enjoyed by music lovers from all corners of the world. Silva explains “I want my mom (who isn’t a musician) to listen to the record and enjoy it, tap her foot and feel the vibe”. On Break Free, Silva’s vision is truly realized with the help of this accomplished ensemble. Delivering this album with a beautifully fresh and positive outlook for music and the world as a whole, the skilled guitarist takes his listeners on a musical trip with each composition. Recorded at Big Orange Sheep Studios, Brooklyn, Break Free showcases Silva’s talents as not only a guitarist but as a dynamic composer too. Opening track “Africa” as the title aptly suggests, is influenced by African rhythms and the Benin-born guitarist and composer Lionel Loueke. Other stand out tracks from the album include “Royal Song” an eclectic amalgamation of modern jazz and Afro-Brazilian genres like Baião and Afoxé, and “Brooklyn Bound” which, reflective of New York City, is a fast paced and boundless tune. With an ECM type of vibe to its groove, while still maintaining a strong Brazilian influence, “In Search of Peace” was written in a moment of turbulence for the bandleader. This composition provided Silva with an ideal outlet to find tranquility and peace during this time. While “Samba e Amor” pays tribute to one of the most accomplished Brazilian singers and composers, Chico Buarque, the title and closing track off the album exhibits what Silva believes the world needs today. Reflective of Break Free as a whole, this song exudes hope, while exhibiting strong melodic and harmonic content. Flavio Silva presents this new and exciting album as a musical statement, with the hope that its message and deliverance evokes a mutual feeling of love and understanding throughout the universe. Flavio Silva is one of the many Brazilian composers and instrumentalists that has been breaking through a variety of music scenes, such as that of Brazil, The Netherlands and most recently, New York. The guitarist has studied with some of the best musicians in Brazil and all over the world, including Michel Leme, Alexandre Mihanovich, Djalma Lima, Mike Moreno, Adam Rogers and Antonio Hart, who became his mentor since his arrival in New York. Flavio has shared the stage with some highly skilled musicians such as Antonio Hart, Seamus Blake, Victor Wooten, Munir Hossn, Kendrick Scott, Eric Harland, Marcus Gilmore, Ben Williams, Louis Cato, Reggie Washington, Alex Han, Cuca Teixeira, Sandro Haick, Thiago Espirito Santo, Nicolas Viccaro and Etienne Mbappe, among others. Flavio has also performed at some of the biggest festivals in Europe including the North Sea Jazz Festival (The Netherlands), Langnau Jazz Nights (Switzerland), Koektebel Jazz Party (Ukraine), Gronau Jazz Festival (Germany) and Delft Jazz Festival (The Netherlands) alongside performances at US venues including The Kennedy Center (Washington D.C), Smalls Jazz Club (NYC) and Smoke (NYC), among others. Flavio endorses Mono Bags, D’Orazio Strings, Free The Tone Effects and Reference Laboratory Cables.